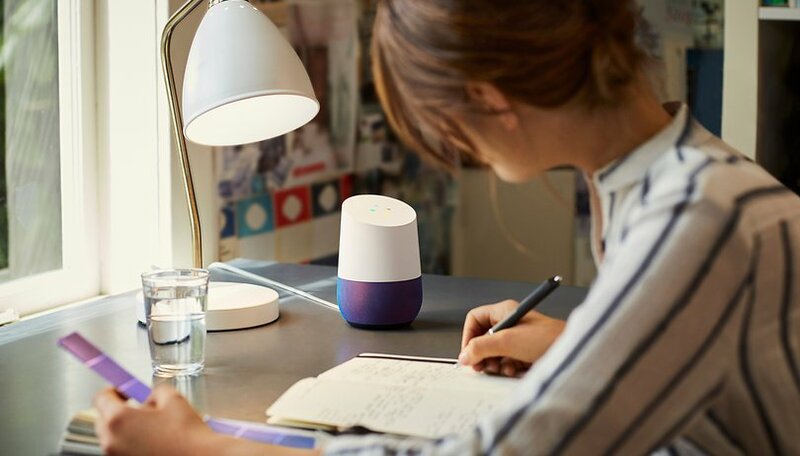 Google Home is a voice activated speaker that can be used to help manage your daily life, thanks to Google Assistant and its ability control devices around your home. If you want to know more about what the Amazon Echo competitor can do, you're in the right place. Google Home can assist you with keeping track of your tasks. For example, you can order products from your favorite store just by using your voice, or add items to your shopping list. Plus, you can set a timer if you're cooking or an alarm to help you wake up on time for an important meeting. Google Home can help you find out information in an instant. You can ask it to do math for you, look up words in the dictionary and even translate to another language. It can keep you up to date with the latest in sports and finance. And, in the kitchen, you can use it to convert units of measurement for recipes and find out how many calories are in your meal. Google Home can help you stay on track with your daily schedule. It integrates with Google Calendar, so it can tell you when events are happening. For example, you can ask for it to tell you when your first event and next event are happening, or it can list all events happening on a particular day. Plus, it will help you get to those events on time by sharing traffic and flight information (including flight prices). To help you be prepared, it can tell you the weather report and search for nearby places. The best way to get a rundown of your day from Google Home is to say "Start my day," or "Tell me about my day." It will then give you a curated overview of the weather, calendar events and commute, plus reminders and news. To keep you entertained, Google Home can play music from Spotify and radio stations, plus podcasts and news. But, the real power of Google Home is in its ability to control devices. For your audio enjoyment, you can control multiple Chromecast-enabled speakers, giving you the ability to manage multi-room audio and streaming. You can also stream your favorite shows to a TV, and pause or control the volume while watching. Like I mentioned above, in addition to being intelligent, the real power of Google Home is its ability to control devices. You can control your TV and speakers around the house, but there's more to it than just entertainment options. Google Home has the ability to manage lights, smart plugs, switches and the thermostat - enabling you to put your home life on autopilot. Google Home also works with IFTTT, which means you can program a custom phrase to trigger certain actions that you choose. For example, you can program it to say, "Get these kids off my lawn," to trigger the sprinklers in your yard. In today's world, one of the most important elements of a smart home control center, such as Google Home, is its ability to incorporate systems from other manufacturers. Google Home has some tough competition with Alexa (Amazon Echo) and Apple's HomeKit, and it has a fair amount of catching up to do with them too. In the expanding universe of the smart home, more and more manufacturers are getting on board with voice activated device control - who knows, perhaps in a nearer future than you realize, you will literally be able to do everything without lifting a finger! You can use the TP-Link smart plug to remotely access and control devices plugged into the smart plug. It works with the Kasa app on your smartphone, from which you can access some handy features like scheduling, "away mode" for when you're on holiday, and it works with Amazon Alexa as well as Google Assistant for voice control. Have a look at the TP-Link website for more information on their smart products to deck out your home. The Logitech Harmony Hub can be used in conjunction with your smartphone to control the smart devices in your home. Basically, it turns your phone into a remote control for home entertainment systems, lights and whatever else you might have in your abode. It works with the Harmony app from the Google Play Store, or you can also get the Harmony Companion remote control. Vivint smart home is a leader in the world of home security and offers several elements to make up a smart security package that you can set up around the outside of your house for peace of mind when you're both away and at home. You can set up all kinds of things like a doorbell camera, a smart lock for the front door, general surveillance cameras and also smart garage door control. The smart security devices can be controlled through the Vivint Smart Home app from Google Play Store. August also has a range of smart home security devices like a smart lock, doorbell cam and a few other gadgets so that you can control access to your home through your smartphone. These can be managed through the August Home app on Google Play Store. When it comes to fire safety in your home, look no further than First Alert's OneLink smart smoke detector. Admittedly, it works pretty much the same as a normal smoke alarm, with the difference that you can test or silence false alarms from your smartphone. You'll also receive notifications to your smartphone if the detector senses something abnormal. The Rachio smart sprinkler is only really useful if you have a yard. You can monitor and control water sprinklers through the app on your smartphone, which can also advise you on the weather forecast (so you can avoid watering if it's going to rain) and you can set it up to keep all your plants alive while you're on vacation. Just download the Rachio app from the Google Play Store and you can be on your way. The Wink smart home hub is now on its second generation of smart home control devices. Through this hub, you can control all the smart devices in and around your home from your smartphone like smart bulbs, home security and lighting. Here's a link to the Wink smart home app on Google's Play Store. The LIFX smart light bulb has actually been around for a while - the third generation of this light bulb is even brighter and has an even more impressive range of colors to suit your mood and taste. Control the bulb remotely and within the home through the LIFX app from the Google Play Store, which includes some neat touches like security mode, which turns the lights on and off even when you're away, to make it look like someone's home. The Anova Precision Cooker is the ultimate smart cooking companion! Your food will be cooked to perfection with this handy little kitchen device - no more under or over-cooking and you can even get other things done while your meal is cooking, as you will receive a notification directly to your phone once it's ready. Download the Anova Culinary app from the Google Play Store. Are you a fan of Google Home or Amazon Echo? What do you wish Google Home could do? Let us know in the comments. work as an intercom too. I would also like a smaller, extra unit available like the echo dot, that I could put in additional rooms for a lesser price. Sooner would be better than later, lol. That's a great feature idea!